I have had this lovely turkey feather for some time, but struggled a bit with subject matter. The lovely barring and dark color meant that a dark or brown colored subject would not contrast well with the feather. In the end I decided to paint a bald eagle. These birds have an immense fierce pride to them, but at the same time I also know how goofy looking fish eagles can be. I hope I captured a bit of both in this painting! Acrylic on 2" x 8.5" Eastern Wild Turkey tail covert feather. EDIT: Wow, thank you so much for the DD! Since I am now getting a lot of questions: yes! This is a real feather. It is possible to paint on them with care. To learn how I do it, please see the link above! This is...incredible!!! I don't even know how you do it, but my explanation is magic. xD Just fantastically done!!! I commend your artistic brillance to do something like this! Wow! Stunning doesn't begin to describe it! I live in South Africa & over the Easter holidays, visited Kruger National Park with my family. We had a wonderful day of viewing animals & were fortunate to see so many of them, mostly right by the roadside. We saw a Fish Eagle sitting on a tree stump and also another kind of large eagle ~ we were right next to the tree it was in, looking up at it. I would love to see what you could do after a visit to Kruger with your talent! Please keep on giving the world the gift of your awesome talent. Blessed be & thank you for making the world brighter! Thank you for all of your kind comments, they've really touched me! wow....how can you picture in feathers???? I regret I don't remember... I painted this one last year. Probably a few days worth of work? Thanks! Simply amazing piece of work! I agree the turkey and Bald Eagle both have have an immense fierce pride to them, you summed up their look in three words, and it is amazing! Alas, for me in the USA it would be illegal. It's a neat idea though. Thanks! This is wonderful! I'm very impressed by what you managed to do. What size brush did you have to use for this? I think I used a size 1 or size 0 brush. 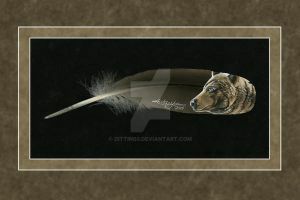 Wow, that's got to be very painstaking to paint with such detail on a feather! You have much patience! That's just amazing! I can't imagine how difficult it must be to paint like that on a feather. Hey, congrats on the DD! I recognized this as soon as I saw it among the DDs Definitely a stunning eagle. OH I'VE SEEN THESE BE4 THEY R AWESOME!how do u makem? Simply amazing. I am gonna have to give this a go some time. Awesome stuff. And this is a really cool idea- to paint on feathers. i didnt know was possible to paint on a feather and be so amazing like this, when i saw the first time i thought you had painted the feather too, that it was all a painting, when i read the description i realized it´s a feather painted on. Great! Whoa! This is SO cool, and totally wicked!! It is very...mythical. And it looks like an optical illusion when you stare at it in a certain way. The position of where my most favourited animal ever created, "The American Bald Eagle" is very unique, why? Because the way it is staring at you, and the parts of the bird that aren't painted and left out such as parts of it's skull as well as the body in left out, thus creating an illusion in which is shown as though the bird is inside another dimension of some sort, and staring right into this unusual world, and as well as your very soul. It's a very Very interesting piece.. Unique..I would LOVE to buy one! !